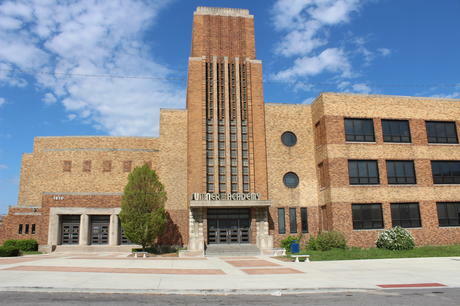 Due to retirement and more incoming students, we are looking for physics, chemistry, and biology teachers to fill two science positions at the wonderful Sumner Academy of Arts & Science, a grades 8-12 college preparatory magnet school within the Kansas City, Kansas Public Schools and an IB World School. If you want to teach at a school where you can make a difference in the lives of a diverse mix of inner-city kids, then this is it. If you don’t teach science, we’re also looking for other dedicated professionals; see below for links to job postings. We are consistently ranked as the number one school in Kansas by Newsweek, Washington Post, and U.S. News & World Report, but these metrics are nothing next to the chance to work with other teachers curious about science and committed to their craft, teaching students who merit the best teaching. Opportunities for high-level curriculum development abound. New teachers will most likely teach some combination of Science 8, Physics 9 (only a general KS science certification needed), and Biology (currently 10th grade). See below. Chemistry teachers are also encouraged to apply, to teach Science 8, Physics 9, and (in a later year) Chemistry 10. During our PCB transition, we will need people who know chemistry. Not all courses have traditionally used Modeling, but two of our teachers have been trained in Modeling Physics and use it, and the others are receptive to Modeling. Grade 8: Science 8. This summer we will be transforming a memorization-heavy Earth & Space Science course to include more experimentation, guided inquiry, and laboratory skills to support further science study through International Baccalaureate (IB) science courses. We plan to include physics and chemistry themes used in later courses. Grade 9: Physics 9. This Physics First course is currently taught using Modeling Physics, with which we have been pleased, but since we are switching later courses to include chemistry before biology, we would like to interleave modern applications. Grade 10: Chemistry 10. Chemistry is currently taught in the 11th grade but in the next several years will be moved to the 10th grade, and we will be doing the curriculum development in-house. Grade 11: Biology 11. Biology is currently taught in the 10th grade but in the next several years will be moved to the 11th grade. Grade 12: Physics 12. This is a more advanced physics course that satisfies Kansas requirements for physics. This is currently taught using Modeling Physics. Grades 11-12: International Baccalaureate science classes. Students who choose to take our two-year Standard Level and Higher Level science courses generally double up on chemistry and biology in the 10th grade. We currently offer Physics; Chemistry; Biology; and Sports, Health, & Exercise Science. We are also considering developing an IB Career Certificate program.